The 45-minute flight from Appleton, Wisconsin to Minneapolis, Minnesota to join a celebratory road trip marking Harley-Davidson’s 115th anniversary felt much farther than that. This wasn’t just a trip for me, more like a pilgrimage. It was a quest to find what magic—if any—is still alive in Harley-Davidson's iconic brand. I wanted to understand what it is about a bar and shield logo that ignites such passion in so many people. I’ve been a rather candid critic of Harley-Davidson Motor Company, as it likes to call itself, and it's well-aware of that. So I give the folks at H-D a lot of credit for inviting me on this trip making an effort to change my mind. The first day of riding was plagued with rain. 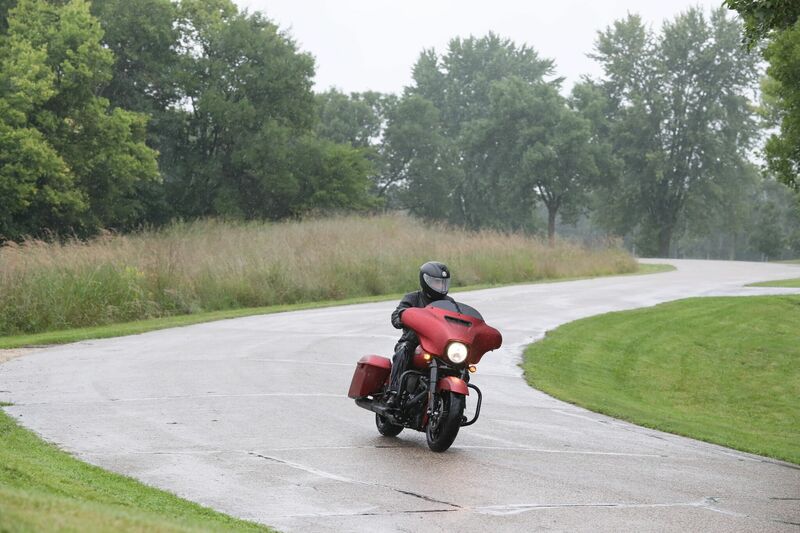 It was raining in the morning when our kickstands went up and either stayed the same or got worse the whole way from Minneapolis to LaCrosse, Wisconsin. I thought the rain was symbolic of Harley-Davidson’s current state. With slow sales, a factory shut-down, and a feud with the President of the United States, there are plenty of metaphorical rain clouds around the business right now. When I told a friend I was attending Harley-Davidson’s 115th Anniversary celebration he jokingly asked “So, are they gonna make it to 116?” Harley is in such bad shape that even to people who aren’t in the motorcycle world are aware of its troubles. As I rode a red Street Glide through the rain, I had some time to reflect on where H-D is, where it’s been, and where it’s headed. I thought about its 115th anniversary and whether that number actually has any significance. Harley celebrates its continuing existence every five years, so what makes 115 so special? As for the Street Glide itself, it was one of the least surprising bikes I’ve ever ridden. What I was expecting was a big, loud, heavy bike that’s comfortable on the highway and more agile than it looks, but hard to maneuver in a parking lot. That’s exactly what the Street Glide is, and I think that’s why it’s so popular. It's the same feeling found in most full-size pickup trucks I’ve driven—familiar and unsurprising. Brand loyalists like both those qualities and are willing to pay a ton of money for it. The bike is equipped with Harley's new BOOM! Box GTS infotainment system, which is new for 2019. This all-touchscreen system is snappy and glove-friendly without needing those special gloves for smartphones. It also has Apple CarPlay which is a nice touch, but I wasn't able to use it since I'm an Android guy. It's not bad and it's pretty user-friendly, but it's nothing groundbreaking. I also spent some time with a Road Glide. The Road Glide is the same as the Street Glide except for the different front fairing, a fork-mounted gauge cluster that turns with the handlebars, an infotainment screen that’s harder to reach, and more swept-back buckhorn handlebars. Mechanically, it's the exact same bike. Where I did find some surprises was on the CVO Limited. When I saddled up on the fully dressed luxury touring bike, the first thing I noticed was how heavy it was; the weight difference going from the Street Glide to the Limited was noticeable. Once I was in the big, comfy saddle, I started looking for the controls for the power adjustable windshield to optimize rain deflection. After a little bit of fiddling, I realized that this top-of-the-line touring bike with a starting MSRP of $43,889 does not have an adjustable windshield. It’s fixed and it’s not going anywhere. In case you think I’m asking for too much, the similar Indian Roadmaster starts at $28,999 and comes with that feature standard. I repeat; this is a $44,000 motorcycle. That ugly piece of plastic you see to the right of the infotainment screen pops open to reveal a spot for your phone next to a USB port. That’s a nice idea, but the execution looks far too cheap for the price point. Couldn't Harley have cleaned up this design a little more? It would be hard for a car that costs half as much as a CVO Limited to get away with these panel gaps and this flimsy plastic mechanism. Now, you might think I’m being picky with these complaints, and hey, you might be right. But if Harley-Davidson is going to charge as much as a well-appointed Ford Mustang GT for a motorcycle, you’re damn right I’m going to get picky. For that kind of absurd money, it had better blow me away. Granted, it did, but only with its lousy fit and finish and shocking lack of features that are standard on much-lower-priced competitors. But hey, if you want the 117ci V-twin and that cool paint and you think that makes a CVO Limited worth $15,000 more than an Ultra Limited, then knock yourself out. At this point, you’re probably wondering if there are any Harleys that I actually like, and the answer is Sport Glide. I spent some time with one of the newer additions to the revamped Softail lineup and was quite impressed. The Sport Glide is the one with the weird-shaped removable fairing and removable saddle bags. Going from big, fat touring bikes to the Softail was very refreshing, and it's very tossable for a bike this size. It has forward controls which I normally don’t like, but H-D put the foot pegs at good, comfortable spot in-between a mid and forward setup. The Milwaukee Eight 107 engine doesn't disappoint; this was by far the most I’ve ever enjoyed a Harley. That front fairing sure looks weird, though. One of the top styling folks at Harley-Davidson was at this event had mentioned that he used to work for Hummer. You remember Hummer. It was a brand that carried lots of patriotic heritage making SUVs that were overpriced, gaudy symbols of American excess. It relied so heavily on its character rather than the products themselves and was managed so poorly that it no longer exists. Ring any bells? I went into this with an open mind, but I’m afraid a lot of my negative thoughts on Harley-Davidson were confirmed or strengthened by my experience riding the bikes and getting a taste of the brand's culture. A lot of the stereotypes are absolutely true. The company out of touch with what the new generation of riders wants and charges too much money for bikes that are supposed to be premium, but just aren’t. Harley-Davidson spent way too much time betting way too much on brand loyalty. The American auto industry made the exact same mistake in the 1970s. The American brands never saw the Japanese brands coming and didn’t take them seriously. Pretty soon it was the Chevy Vega and the Ford Pinto vs. the Toyota Corolla and the Honda Civic. We all know how that movie ends; the U.S. thought people would still buy domestic junk just because it’s American, and Japan ended up getting a massive foothold in the U.S. that Ford, GM, and Chrysler never fully recovered from. In much the same way, I don’t think H-D saw the European brands coming. Traditionally, the people in the market for a Harley-Davidson would never consider a Triumph, Ducati, or BMW, but things have changed. Riders who want an adventure bike or something with stronger performance or more modern features for the same money or less are jumping ship. Those big three from Europe have adapted and grown over time and they’re all seeing pretty strong, consistent growth (see here, here, and here) despite what you hear about the motorcycle industry being in the toilet. It makes you wonder: are Americans really moving away from motorcycles, or does it just look that way because Harley-Davidson, which still has a dominant U.S. market share, is hurting so badly? 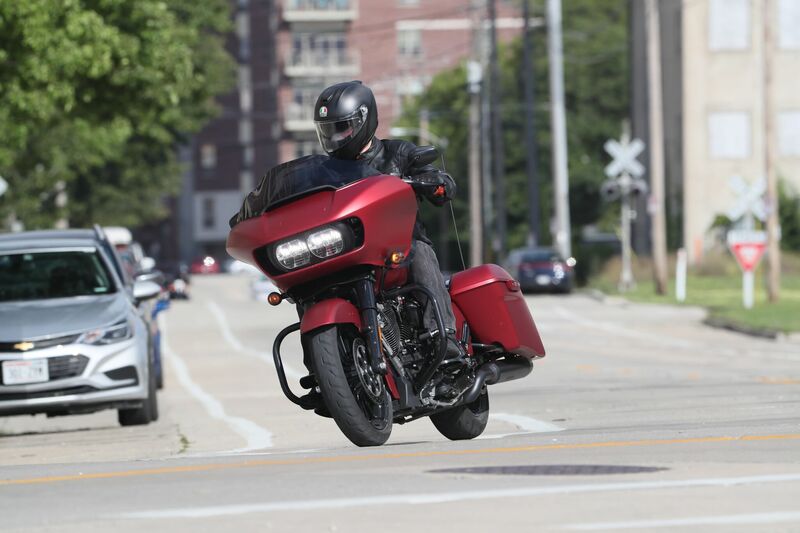 When we got into Milwaukee after a couple days of riding, we were greeted by a few of the company's executives who wanted to talk about the 115th anniversary and where the brand is headed. Two were great-grandchildren of one of the Davidsons in “Harley-Davidson.” And at one point in the panel, Bill Davidson copped to something especially telling about the brand with his name on it. He said Harley-Davidson motorcycles are about three things; "look, sound, and feel." Let me repeat that. When Harley-Davidson builds a bike, it has three major priorities; look, sound, and feel. Just a couple things that are notably absent from that list are performance and value. Harley-Davidson straight up admits that how a bike sounds is more important to them than how it performs—even if that reality is usually obscured in marketing-speak. This goes back to my thoughts that H-D is making the same mistake as the American auto industry in the 70s. It’s the ethos that it doesn’t matter how much it costs or how it performs, people will buy it anyway because it looks cool, sounds cool, and “feels” like a Harley-Davidson. Incidentally, what does “feel” mean? Does that mean the bikes vibrate a lot at idle and that’s supposed to be a good thing? Because they certainly do that. Admittedly, performance could be considered part of the bike’s feel, but H-D’s use of the word “feel” seems more abstract than that. I think they’re talking about how the bike makes you feel when you look at it, hear it, and ride it. Not about how it performs, but how it hits every sense. If Harley-Davidson continues on this path, then the Motor Company is, in a word, screwed. While H-D is designing and building bikes around look, sound, and feel, its competitors are focusing on value, performance, reliability, and capability—while incidentally often managing to outclass H-D in those look, sound, and feel categories. Then there's the domestic competition. Indian Motorcycle has been killing it in its products, on the flat track, and in sales. But H-D won’t take them seriously because, as I actually heard a high-ranking Harley-Davidson employee say, “that’s not really Indian” since it’s owned by Polaris and isn’t the same company it was in 1901. I don’t care if it’s Indian, Victory, Polaris, or John Deere, when you have a direct competitor that is growing while you are shrinking, you had better take them seriously no matter what name is on the tank. Maybe even take a few notes on what they’re doing differently than you. It’s not good for Harley that loyalists who had previously never considered a bike from any other brand are starting to shop around. They’re finding bikes that they like more from brands they’ve never considered before. I’ve met Harley owners who talk about Harley-Davidson like it’s the only brand of motorcycles that exists. It’s a mentality that I’m all too familiar with having lived in Harley’s home turf of Wisconsin my whole life. Harley made a pretty strong business for a long time out of relying on the loyalty of these purists, but others are getting wise to Harley’s act. “Character” and “heritage” aren’t enough anymore. But Harley-Davidson knows this. The company believes it has several aces up its sleeve with a slate of new bikes it has coming out like the electric LiveWire, the unnamed naked bike, and the Pan America adventure bike. I’m really happy that H-D is finally stepping out of its comfort zone, but if it messes up on the execution of those bikes, then it's in for a world of hurt that will make 2018 seem rosy by comparison. Harley-Davidson gave Ducati and Triumph a quarter-century head start on naked bikes, and it isn’t going to be easy to compete with the Monster and the Speed Triple on its first try. As for the Pan America, which mostly seems like an effort to stop people from jumping ship for the Triumph Tiger and BMW R 1200 GS, I haven’t heard anyone who is into adventure bikes say anything nice about it. The electric LiveWire needs to be as good or better than what Zero and Energica already have on the market—and most important, it needs be priced competitively. The closest thing we've seen to a production Harley-Davidson LiveWire. No touching. Also, H-D employees throw around words like “super ultra mega premium” way too much when talking about the LiveWire. To me that makes it sound like this thing is going to be at least $30,000, which would likely kneecap it out of the gate. If that’s the case, it’s only going to be bought as a novelty by people who already have multiple Harley-Davidsons in the garage. H-D also kept talking about how more electric bikes will follow which makes me think they’re talking about bikes that normal riders who want to go electric can actually afford...eventually. When Don Draper drove a Jaguar XKE in Mad Men, he sat next to Joan at a bar and said: “I don’t know what it is, that car does nothing for me.” Now, Don is crazy, because if an E-Type doesn’t make you feel anything, then something is wrong with you. But that’s exactly how I feel about the Harley-Davidsons I rode (and maybe something is wrong with me, too). I rode motorcycles that a lot of people would kill to ride. Bikes that a very specific category of riders dream of, but will never be able to afford. But much like Don and the Jag, they just did nothing for me. I experienced the “character” that Harley is always talking about and it remains something I just don’t understand. More to the point, I don't understand why a new rider would pay top dollar to feel it either. A while ago I wrote about why millennials like myself aren’t interested in Harley-Davidson. In that piece, I recalled a Bob Lutz interview with Popular Mechanics in which he talked about an argument he had with Lee Iacocca about the old Chrysler Imperial. Lutz explained to Iacocca that the reason he didn’t like it and Iacocca did wasn’t an age thing, it was a generation thing. Iacocca liked it because when he was 40, that’s what American luxury cars looked like. But for Lutz and his generation, that kind of car does nothing for them. They’re more interested in high-end European cars, and today's luxury car market has proved Lutz exactly right—not only about the Imperial, but about how generational tastes change. It’s the exact same thing with Harley-Davidson. The youngsters who aren’t interested in traditional Harleys now probably never will be, no matter what fancy wheels or paint jobs they have. And that’s why the new bikes H-D has coming out in the next few years had better be really good. I’m talking industry-shaking good. Harley’s future streetfighter, adventure bike, and even the electric bike already have very tough competition that’s on the market right now. What I’m saying is, Harley needs to take some advice from RuPaul: Don't f*** it up.